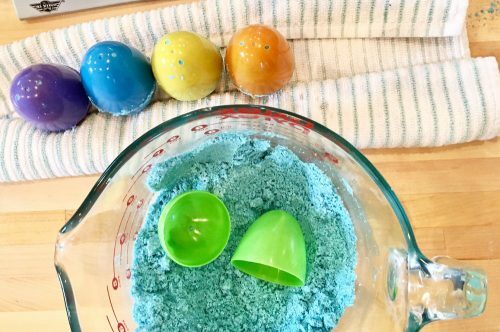 These DIY fizzing Easter egg bath bombs add a bit of fun to bathtime! The finished DIY Easter egg bath bombs fizz & bubble and color & sparkle! They also nourish skin with natural cocoa butter, babassu oil and yogurt powder. 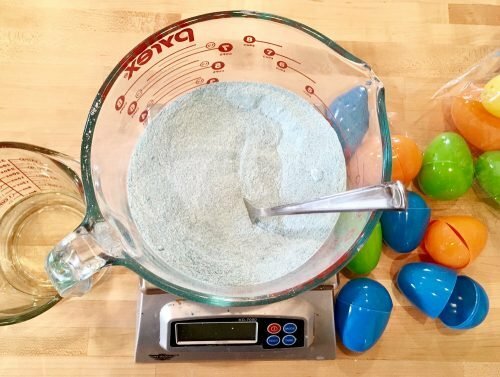 These fizzing DIY Easter egg bath bombs make a wonderful addition not only to kids’ Easter baskets, but are also great gifts for friends, family and neighbors for spring! This particular recipe was inspired by my friend, Cathy, who loves Lush’s golden glitter egg bath bombs. While these don’t have quite that much glitter, you can easily increase the amount of both the bath bomb color powder for more color as well as the amount of skin safe glitter for some serious sparkle! Following is my DIY Easter egg bath bomb recipe. I used large plastic Easter eggs for my fizzing DIY Easter egg bath bombs. This recipe will yield seven large egg-shaped fizzing bath bombs. 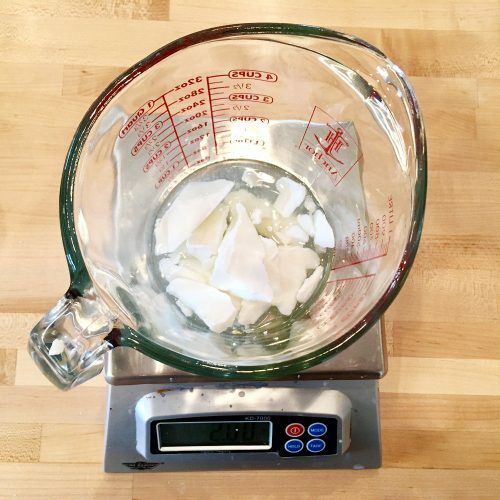 Begin by using a digital scale to weigh out the cocoa butter and babassu oil. Heat at 50% power in the microwave or in a double boiler until melted. If using a fragrance, weigh out the essential oil and stir into the wet ingredients. In a separate container, weigh out the baking soda, citric acid, kaolin clay, SLSA and yogurt powder. You will want to wear a mask for this step as the SLSA is an airborne product and it will get into your nose without a mask. 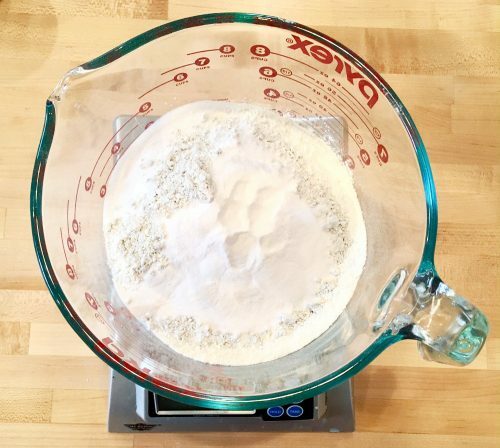 Mix the dry ingredients until thoroughly combined. 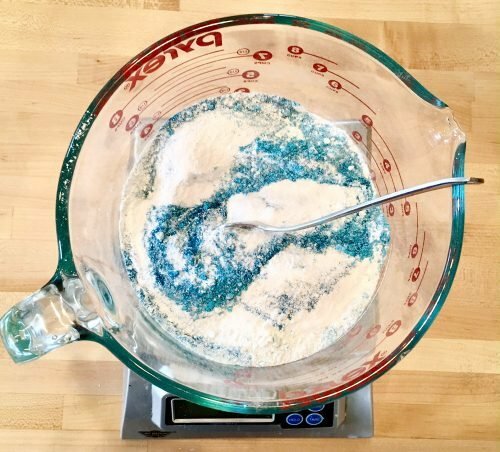 Mix the color and glitter into the dry ingredients until they are all a uniform blue color. Now combine the wet and dry ingredients. Mix well. 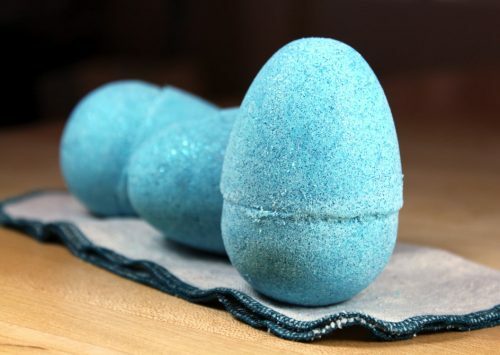 You’re now ready to make mold your fizzing Easter egg bath truffles. Pile the mixture into one half of a plastic egg. Repeat with the other half of the egg. Now mash the two sides of the plastic egg tightly together. If your plastic eggs are a flimsy rather than rigid plastic, take care not to press either of the halves on top of the other. 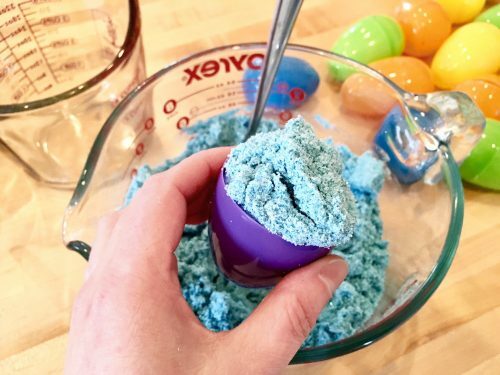 Otherwise your fizzing Easter egg bath truffles will be difficult to remove from the plastic egg mold. 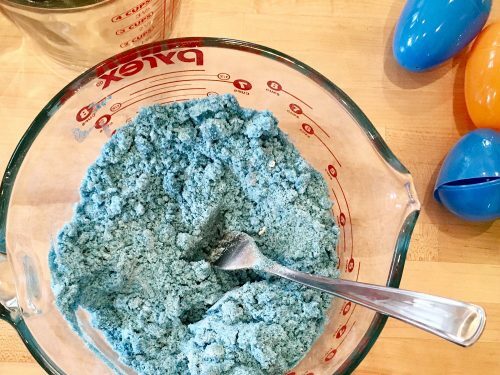 Repeat this process until you’ve molded all seven fizzing DIY Easter egg bath bombs. 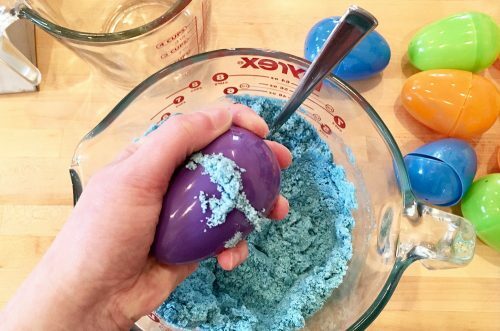 Set the molded Easter egg bath bombs aside for an hour or two in a location where they won’t be disturbed. Then carefully unmold each fizzing Easter egg bath truffle and wrap or packaged as desired for gifting. 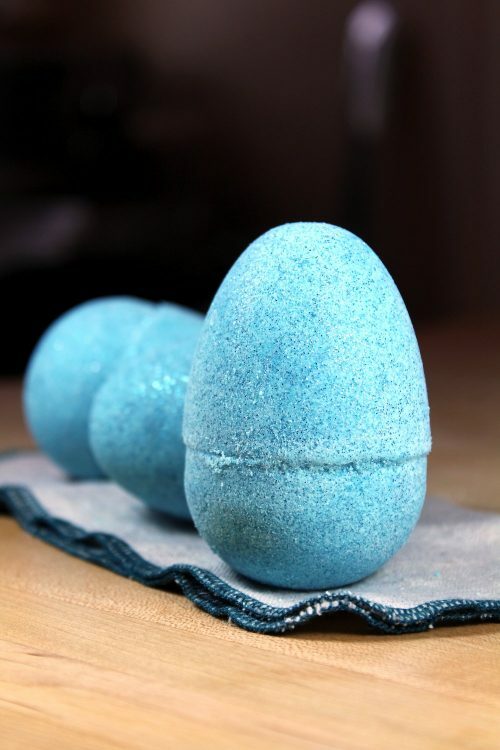 To use these fizzing DIY Easter egg bath bombs, simply add to warm running bath water and enjoy! If you plan to sell your fizzing Easter egg bath bombs, you’ll need to follow FDA guidelines for labeling your product. If you’re unsure about the rules and regulations regarding labeling cosmetics, I highly recommend the book, Soap and Cosmetic Labeling: How to Follow the Rules and Regs Explained in Plain English, by Marie Gale. You can find the requirements for cosmetic labeling regulations regarding this product on the FDA website here. For more great DIY Easter crafts, be sure to check out my DIY Homemade Easter Crafts and Treats Pinterest board. Or to discover more DIY’s similar to my fizzing Easter egg bath truffles as well as other homemade bath and body and soap recipes, be sure to check out my DIY Bath and Body board on Pinterest. These will get hard with only oil, butter and EO as the liquid ingredients? No witch hazel? Absolutely! I never use witch hazel in my bath fizzies.